December mining symposium: Register for training course by 16 October! 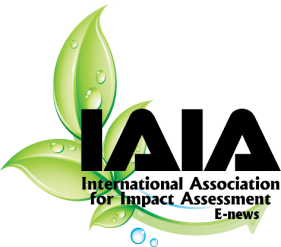 As an introduction to the conference theme, the IAIA19 Organizing Committee invites you to read their article in IAIA’s journal, Impact Assessment and Project Appraisal, at www.tandfonline.com/doi/full/10.1080/14615517.2018.1516846. This article is free for anyone to access through 30 June 2019. A one-day training course will be held immediately prior to the symposium on 3 December: Key Concepts and Tools for Integrating Human Rights into Impact Assessment. Pre-registration and pre-payment by 15 November is required – but please register early! The course will be cancelled if it does not reach the minimum number of paid participants by 16 October 2018. A special symposium, “Using Impact Assessment to Achieve the SDGs in Asia,” was held 1-3 October 2018 in Kuching, Malaysia. 129 delegates from 12 countries came together to discuss how voluntary IA tools and techniques, such as sustainability assessments, life cycle assessments, risk assessments, and materiality analysis can be utilized in a region where regulatory efforts around IAs continue to experience challenges. Presentations will be uploaded through the end of October. See the symposium website for more information. Are you interested in serving on the IAIA Board of Directors? IAIA members are encouraged to self-nominate for the positions of President and two Directors for the 2019 election, to be held in January 2019 for the three-year term of May 2019 through May 2022. To self-nominate, an interested member should gather at least five signatures of support from other current IAIA members. Please see the Self-Nomination Instructions document for full details. These signatures should be submitted along with the other required details no later than 9 November 2018. Self-nominations received after that date will not be accepted. See IAIA Publications [http://www.iaia.org/publications.php] for updated climate change key citations, “Incorporating Climate Change Considerations in Impact Assessments.” Many thanks to Philip Byer, Arend Kolhoff, Wes Fisher, and Peter Croal for their work on this update! The InterAmerican Development Bank's (IADB) Independent Consultation and Investigation Mechanism (MICI) is renewing its Roster of Experts of the Compliance Review Phase and will be receiving written expressions of interest (EoI) until October 31st, 2018, via email sent to raquelgom@iadb.org. The Roster is integrated by independent consultants with proven experience in the different areas covered by IDB Group operations and the application of its Relevant Operational Policies, specifically environmental, social, and transparency issues. The MICI website [www.iadb.org/en/mici/home] provides information on their work and the Roster of Experts in English and Spanish. The Terms of Reference in English can be accessed here. Ontario Association for Impact Assessment (OAIA): “Planning and Protecting Water Resources: Emerging Issues, Approaches and Technologies” will be held 17-18 October 2018 in Toronto, Canada. For more information, visit www.oaia.on.ca.